Manic Mincers is the thirtieth level in Donkey Kong Country. It is also the second level of the Chimp Caverns area. Taking place in a damp cave, Donkey and Diddy Kong find themselves surrounded by many Mincers in this level. These enemies are found all over the level, moving in several fast patterns so they can hit into the primates. The heroes find themselves dashing under and jumping over them as they ride along platforms. Next to Mincers, the most abundant foe in this level are Krushas, who are found often in the stage. These foes can knock the Kongs in a pit or into a Mincer with their strength. Gnawties also appear in this level, but are less of a threat to the Kongs than the other enemies. Though the level could be hard for the Kongs, Rambi the Rhino, in his final level appearance in the game, can be found in this stage to ride and defeat enemies with. Through out the level, the lighting subtly changes, with it getting slightly darker directly before Rambi's crate, and getting lighter after the letter O, for instance. A Gnawty and a small pit containing a Mincer can be found at the level's entrance. Two more Mincers are ahead, moving in vertical paths. The level's first DK Barrel wobbles immediately before them, and a Gnawty walks between them. A small wall with the letter K next to it is located near the second Mincer in this area, which has a small pit in it. A Mincer floats in and out of the abyss. An Animal Crate containing Rambi the Rhino sits near here by a pit consisting of two moving Mincers that are always parallel to each other. The primates can find a few Gnawties marching down the area after the abyss, being followed by two higher pieces of land with Mincers on the edge of them. Another Gnawty can be found before a pair of Mincers on the highest piece of land. In this Mincer group, one stationary Mincer sits on the ground with the letter O over it, while the other Mincer moves up and down above it. Another pair of Mincers are ahead that move in the same patten, except this time the top Mincer is stationary while the other moves. Four more stationary Mincers grind against the ground after this, and a fifth Mincer travels between the last two of the obstacles. The level's Star Barrel can be found shortly after the last Mincer in this area. Donkey Kong defeats a Krusha with a TNT Barrel. A TNT Barrel can be found immediately after the barrel, along with two Mincers; one of these Mincers are stationary, while the other orbits around it at a quick pace. The heroes can find a DK Barrel on a raised piece of land after they pass a Krusha. Two additional Mincers moving in a circular path are ahead above an abyss that is followed by a barrel and an alcove containing a Krusha. Three more Mincers can be found ahead, each traveling in a circular patten around a Banana Bunch. The primates can find a wide abyss ahead of here with a Mincer grinding in the center of it. A small platform hovers across the whole pit to help the heroes cross it. A TNT Barrel and another Krusha can be found on the opposite side of this pit, followed by a second wide abyss with another moving platform in it. As it pulls them over the abyss, they are taken past two Mincers and the letter N.
A DK Barrel shakes on the other side of the pit, and it can be broken to free a lost partner. A Mincer orbits a small platform floating in an abyss nearby, which is followed by a lone piece of land with a pair of Krushas on it. Another abyss after this area contains a small platform used to cross it. Two sharp Mincers surround it. Once the heroes cross the pit, they come towards a few Gnawties and a sign indicating that the level is almost over on a straight pathway. A stationary Mincer with another Mincer speeding around it can be found nearby, being followed by a group of high ledges. Gnawties march along a pathway that leads farther into the level in front of the ledges. Using a small cave (leading to a Bonus Level) around this area, the primates can access the top of the high pieces of land, where a DK Barrel and a TNT Barrel wait. The primates' path is soon blocked by a wall created by two Mincers stacked on top of each other, which can be jumped over with the use of a tire sticking out of the ground next to them. An exit sign stands on the other side of the obstacles with a tunnel ahead of them that leads out of the level. K: The letter K is located next to a wall under the third Mincer in the level. O: The Kongs find the letter O between a pair of Mincers shortly after they pass Rambi's Animal Crate. N: After crossing the first abyss containing a moving platform, the primates pass the third Krusha from the Star Barrel. The letter N follows the mighty foe above another wide abyss with a platform hovering across it. G: The letter G is found at the end of the second Bonus Level. Mid-way through the level, the heroes can discover a lone barrel near a small alcove with a Krusha in it. They can either pick up the barrel and blast away the wall to the right of the foe with it, or just break it with Rambi. Once the opening is revealed, the heroes must walk in and enter the Bonus Level, where they have to jump on three Klaptraps to earn many Banana Bunches. At some point, the foes are knocked out, and the primates are awarded with an Extra Life Balloon. After they take their reward, they are taken back to the main level. If the Klaptrap enemy hits them at any time in the bonus, they are forced out of the level with the balloon. Near the end of the level, the Kongs can find the opening to a small cave. They must simply walk into it to enter the Bonus Level. Inside, they must sneak under four Mincers as they move up and down. At the end of the area, the heroes must walk into another opening to exit the bonus. This one can be entered multiple times, features the normal level music, and doesn't add to the game completion percentage or whether the "!" indicator will appear on the world map selection, though the Kongs getting hit does result in the room being exited rather than losing a Kong. After exiting the second Bonus Level, the Kongs can find themselves next to a TNT Barrel. They must pick up the barrel and carry it down a ledge. 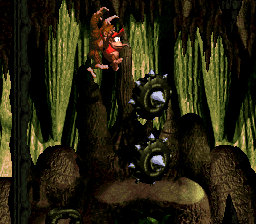 While trying not to bumping any Gnawties, the primates must blast away the first wall they see and enter the opening created to get in the third and final Bonus Level. Alternatively, they can use Rambi if they still have him with them. There, they need to watch as an Extra Life Balloon moves around four barrels. Once it stops and disappears, they have to choose the barrel they think it's located in. If they choose correctly, they are awarded with the balloon and then exit the bonus. If they fail of choose the right barrel, they are forced out of the bonus without a prize. The entrance to the third Bonus Level is located in the wall found immediately after the last two Mincers in the level in the Game Boy Color version, rather than in the wall before them. After the primates find Rambi, they should use him to defeat a Krusha. If they do so, they earn a photograph, found on the ninth page of their scrapbook, of themselves riding Rambi in a jungle area.